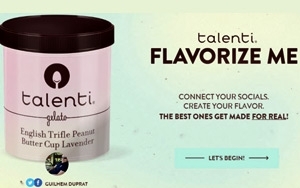 Unilever brand Talenti Gelato is generating personalized flavor concepts for fans by analyzing their social posts. Consumers are being encouraged to visit the campaign's "Flavorize Me" site by August 22 to elect to have an algorithm connect to their Instagram, Twitter and Facebook accounts. The algorithm analyzes commonly used words and hashtags to create personality/flavor profiles for each user that specify percentages of sweet, spicy and salty, and to generate a list of ingredients that fits with each profile. Each ingredients combo in turn generates an ideal, not-in-existence personalized flavor. Given that there are hundreds of available ingredients, there are about 50 million potential flavor combinations, according to the brand. Examples of flavors generated so far, displayed on the Flavorize Me site, include Honey Allspice Nectarine, Marmalade Cabernet Peanut Butter Cup, Ebelskiver Biscuit Mint, Gingerbread Loganberry Malbec, and English Trifle Peanut Butter Cup Lavender. A few Talenti fans actually will have their unique flavors produced, in small batches, by Talenti founder Josh Hoshschuler, and delivered to them. The online tool also tells each user which real, existing Talenti flavor best matches his or her personality. In addition, users can opt to learn more about how their flavor profiles were generated, including which key words drove the outcome. The Flavorize Me tool is being promoted in posts on the brand's social media channels, including an embedded GIF on its Twitter page that illustrates the flavorizing concept. The campaign, from Talenti's creative agency of record, Fallon (Unit-9 helped develop the algorithm), also includes PR outreach to targeted bloggers and online media; paid ads on targeted Web sites and social media; partnerships on podcasts with food and entertainment channels including NPR's "Wait Wait Don't Tell Me!," Splendid Table, Dinner Party Download and Spilled Milk; and a few local sampling events. Launched in 2003, Talenti's "old world" recipes and production methods enabled it to become the best-selling gelato and sorbet brand. According to IRI multi-outlet data, Talenti's gelato and sorbet dollar sales leapt by 82% and 55%, respectively in the 52 weeks ended November 2, 2014 — even as sales for the overall sherbert/sorbet/ices category declined by 6.7%, reported Food Navigator. Unilever, which owns ice cream brands Breyers, Ben & Jerry's, Popsicle, Klondike, Magnum, Good Humor and Fruttare, acquired Talenti in late 2014 for an undisclosed price. The companies said that Talenti would maintain its existing production processes, while benefiting from access to Unilever's distribution network.